Yes, Virginia, there is an Einstein! Breakfast out at McDonald's this morning was especially rewarding. After placing our food order I asked the clerk, a woman of a Certain Age, did she have any Einstein Happy Meal toys? Without doubt or hesitation she checked the toy box and said no, she did not have any and that today was the last day of the Night at the Museum movie promotion. I thanked her and went to our table. A few minutes later our clerk, Virginia, came to our table and presented me with my long sought-after Einstein figure, taken from the display that had been removed! Thank you so very much! Breakfast, Quest, and cultural experiment complete, we left the eatery smiling. To top it all off, a copy of The Plain Dealer newspaper was found at our table and She Who Must Be Obeyed made sure to give me the comic section. What should be on the first page of the comics but a single-panel Bill Whitehead "Free Range" cartoon featuring a caricature of the famous genius. Whoa! Pictured at a cocktail party, we see, under his "Hi, I'm A. Einstein" name tag, an imprint on his tee shirt reading "I'm With Stupids." ← QotD: What is it too soon for? So cool. I'm glad you were finally able to procure an Einstein! The cartoon was great as well. 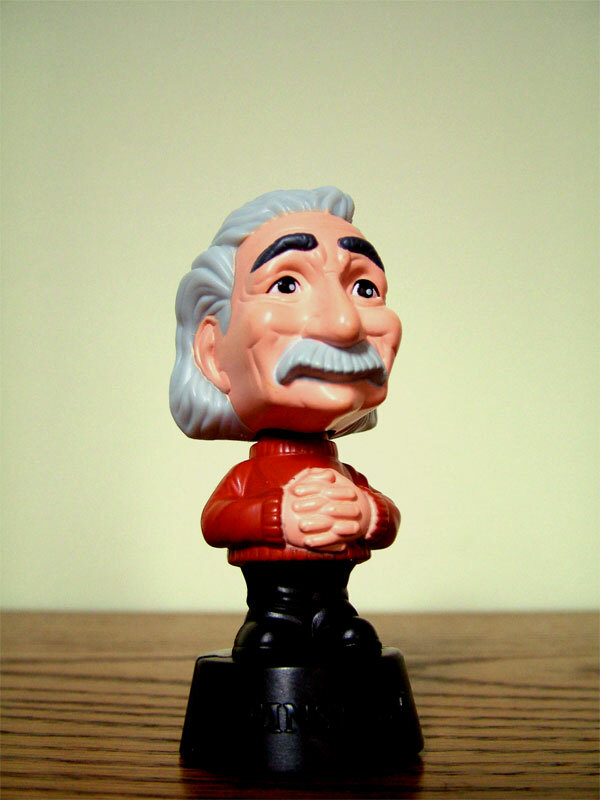 Where will your Einstein reside? LOL the cartoon! I'm glad you finally got your Einstein. Your morning was full of synchronicity.